The movie Conviction: trailer, clips, photos, soundtrack, news and much more! The story of Conviction is incredible, and it’s all true! Nancy Taylor (Melissa Leo) comes to bring Kenny Waters (Sam Rockwell) into the police station. Betty Anne Waters (Hilary Swank) pleads with Roseanna Perry (Juliette Lewis) to come forward with the truth. 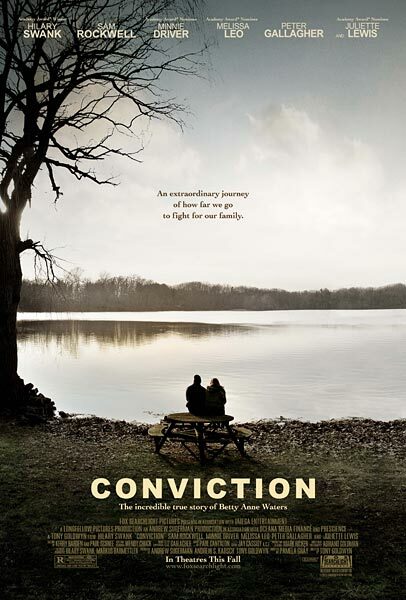 The story of Conviction focuses on Betty Anne Waters, a working mother who puts herself through law school in an effort to represent her brother, who has been wrongfully convicted of murder and has exhausted his chances to appeal his conviction through public defenders. Hilary Swank, Sam Rockwell, Minnie Driver, Melissa Leo, Peter Gallagher, and Juliette Lewis star in CONVICTION, the incredible true story of Betty Anne Waters’ fight to free her wrongly convicted brother. Conviction – The evidence exists. The movie Conviction is based on the true story of Betty Anne Waters: convinced of her brother’s innocence, she decided to earn a law degree in order to challenge the conviction. The film is directed by Tony Goldwyn. It will be released on October 15, 2010. The movie Conviction is based on the true story of Betty Anne Waters. Inspirational is the right word, definitely an amazing true story! Don’t miss the movie Conviction! Betty Anne Waters is an upcoming drama movie directed by Tony Goldwyn and starring Hilary Swank, Sam Rockwell, Melissa Leo, Minnie Driver, Juliette Lewis and Peter Gallagher. The story revolves around a single working mother spends nearly two decades putting herself through law school and tirelessly trying to overturn her brother’s unjust murder conviction. The film is set to open in Fall 2010. I didn’t know about Betty Anne Waters, that’s a truly inspiring story! The studio wants to promote the film as exploration of the profound bond between a brother and sister – a love so deep, so unequivocal, so complete that it becomes a force that will not be denied or defeated. But i see something more interesting in this story: that working hard and dedication to one’s goal can move mountains! Never give up, work hard to get what you really want!